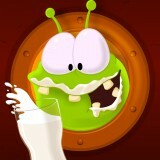 Aliens Like Milk is a fun strategy game for kids. Alex is a cute alien. He likes milk very much, but what a pity there is no more milk in the fridge! It’s time to go in search of cows who will treat Alex with milk. Go towards the new adventures and help Alex get his Milk.